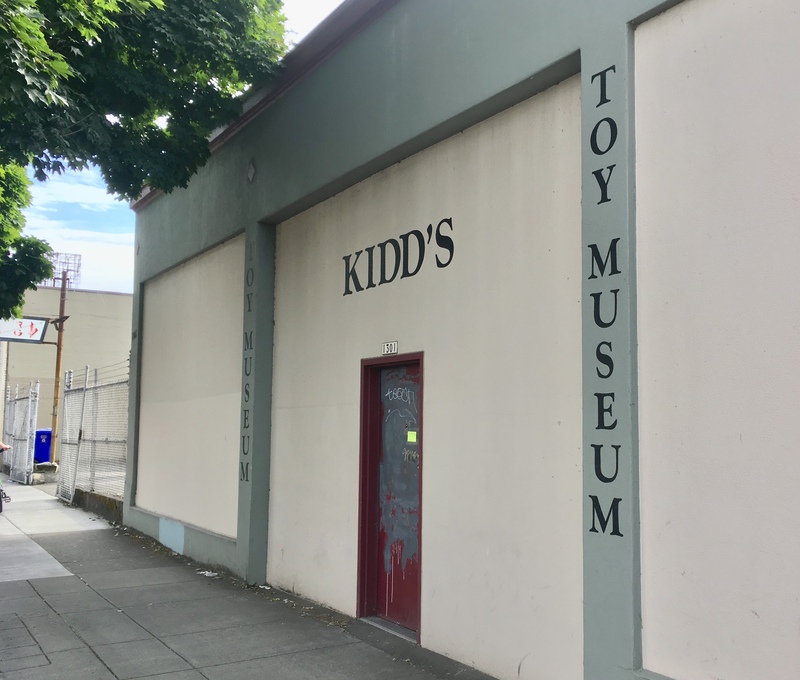 “Nobody knows about us,” was one of the last things we heard as we were leaving the Kidd Toy Museum at 1301 SE Grand Avenue. I had gone there with Will Simmons from Pittsburgh, Pennsylvania who’s famous for his Pittsburgh Orbit blog. The comment wasn’t made to elicit sympathy, it was a statement that had to do with the museum’s no advertising policy. It may have been the ninth time I’d heard about it, more on that later, but the tip that got me through the door came from writer Chuck Palahniuk. 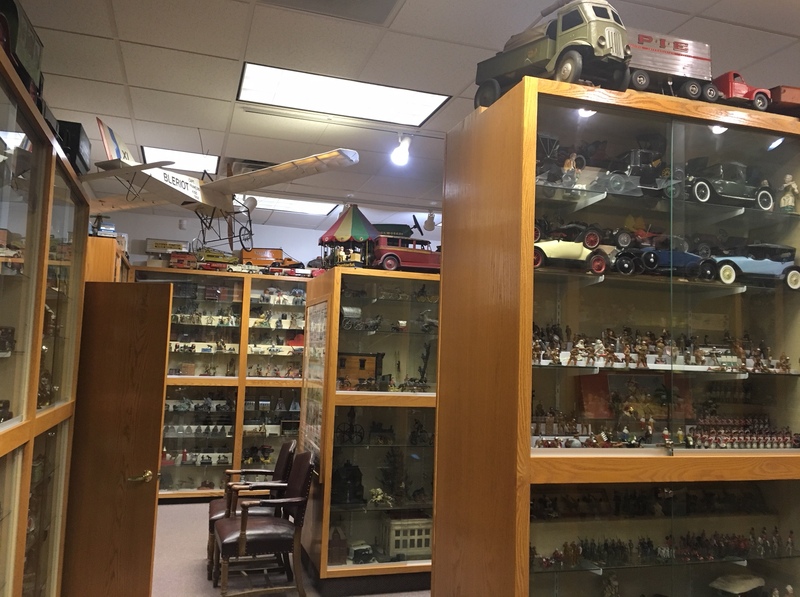 I had heard rumblings about the place and read about it in Palahniuk’s book “Fugitives and Refugees,” but my preconceived notions of a what a toy museum could be may have kept me away. 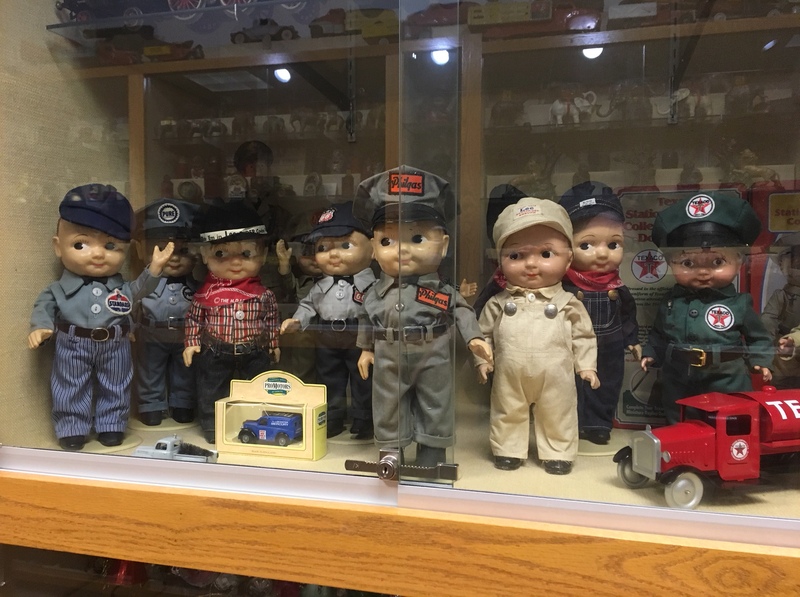 I imagined being herded into an annoying gift shop filled with precious toys for sale, but no, Kidd’s Toy Museum is nothing like that–a characteristic that cements its low-key charm. Palahniuk recommended the place in a list of Portland must-sees in one of the weekly newspapers making it an opportune place to visit with an out-of-town guest. 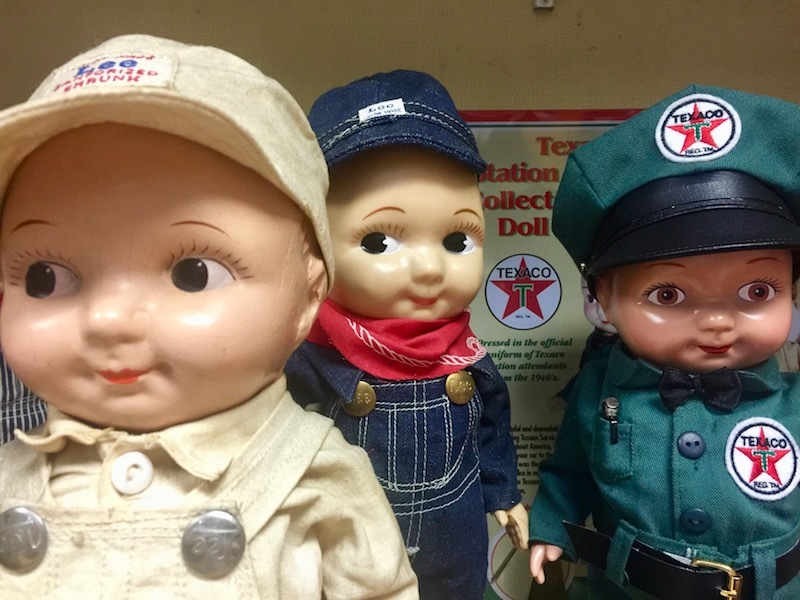 In all my overstimulation resulting from looking through rooms of old toys, I overlooked getting the name of the woman Will and I spoke with as we were headed out the door. She was informative and gracious looking up at us from where she sat in a cluttered office area. I missed the origins of Kidd’s toy collecting mania as it was described because I was slow to turn on my phone’s voice recorder. I recall that Frank Kidd’s collecting bug started with finding and buying a toy on a business trip. Regardless of the genesis, the museum holds quite the collection of banks, dolls, cars, trains and other odd genres. The collection is grouped by category, housed in glass enclosed cases and lit by fluorescent lighting. We were told that the museum exists in part because an inheritance tax that might have required parts of the collection be sold off. Kidd created a nonprofit to keep the collection together, a nonprofit status that requires the toys be made available to the public. One feature of the museum is how unlike a museum it is. 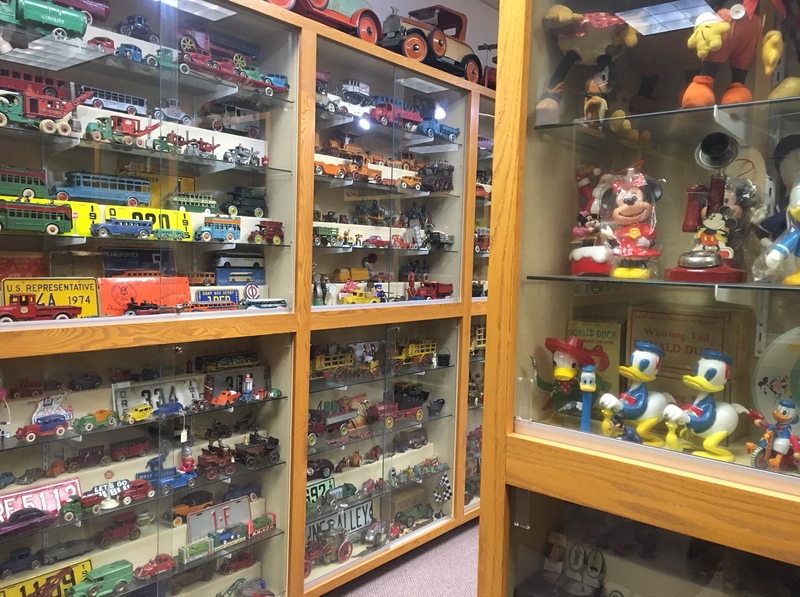 It’s an opportunity to see a well-curated antique toy collection. The displays offer little information like brand names or dates. This minimalism is due, we were told, to the notion that signs would take up valuable display space. 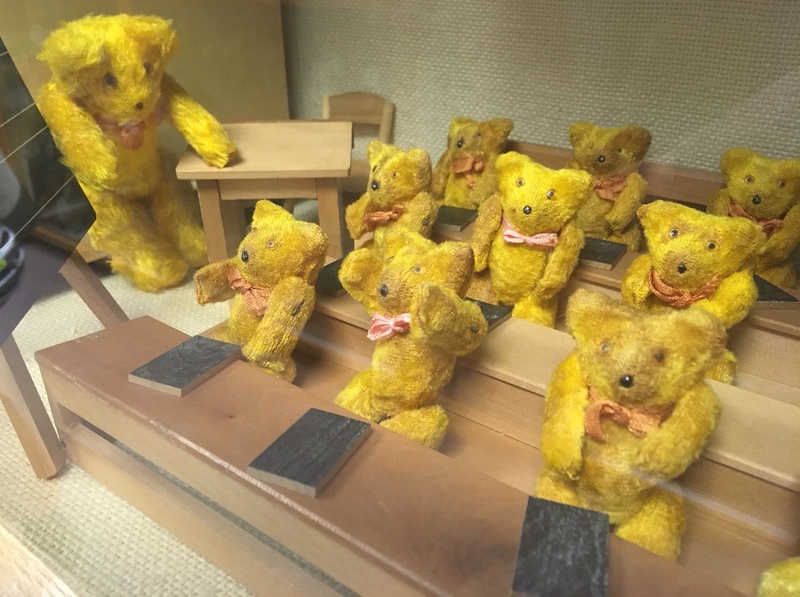 Seeing the objects as they are offers visitors a to experience the toys and form their own interpretations. Word about the museum doesn’t get out due to that lack of advertising. It was explained that, “people locally don’t tend to know we’re here. People from out-of-town look for things to do.” Word of mouth comes from a woman who runs a North Portland candy store who recommends that people visit the museum. People are sure to mention when the “Candy Lady” sent them. As we were running out of conversation we were given a quick lesson in advertising. Our museum contact told us what she’d learned in an advertising class. She explained that you have to see something three times before you actually see it and three more times before you act on it. The math means you have to see something nine times before you do anything about it. The number nine stuck in my mind. It seemed as good an explanation as any as to why I had lived in Portland for nine years before l made it to Kidd’s Toy Museum. Don’t let it take you that long. I received a comment that made a good point. It should be noted that the museum is open weekdays from 9am to 5pm. It has no weekend hours. Note: There are items on display at the museum that some might find controversial. At a time when we’re offering wishes of good will to all mankind I made a decision not to delve into this aspect of the collection. I may visit it at a later time. A classic free box, yours for the taking. My friend Butch Lazorchak had a saying, or maybe it was just something he said once that I associated with him, an expression legendary in my mind. I forgot the circumstances but one day he blurted out, “free is the way I like it.” It’s not catch-phrase worthy, but appropriate in the right situation. 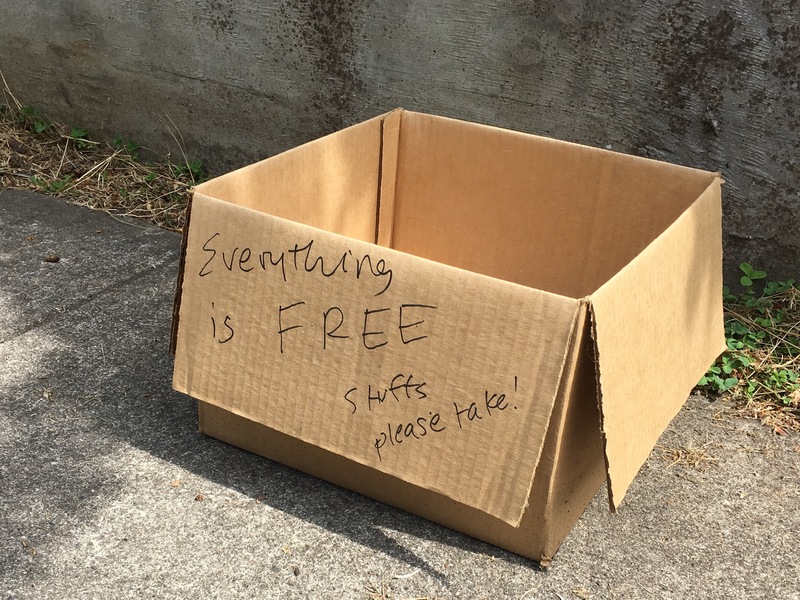 The saying pops into my head when I see a free box or a sign that brings my attention to a free item on a curb. The deal was sweetened with a jump rope and a dog frisbee. I’m not writing about the Freegan lifestyle. That’s a different post. I know there are websites and networks for those who champion that lifestyle. With effort, bargains are sure to be found and technological advances make their pursuit easier. I prefer random encounters with free stuff; things I don’t even have to bring home. 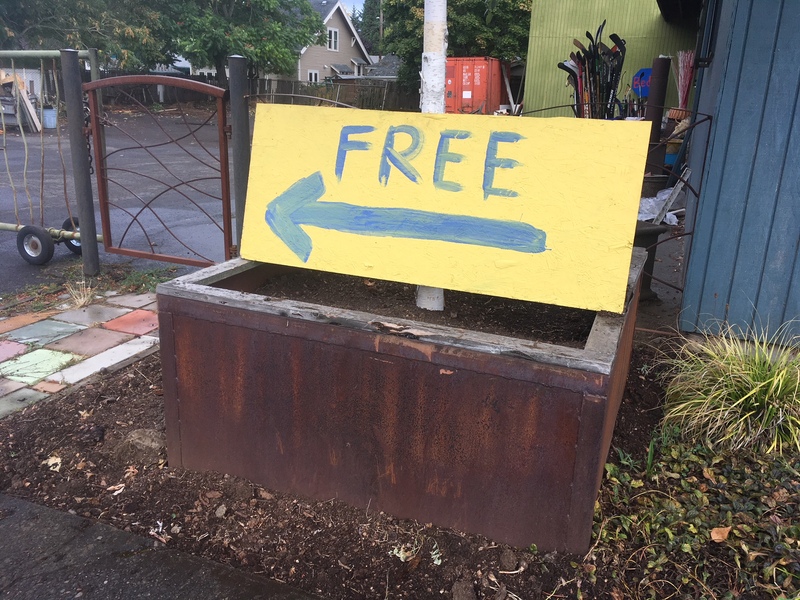 No indication of what’s free, but the sign’s magnificent. 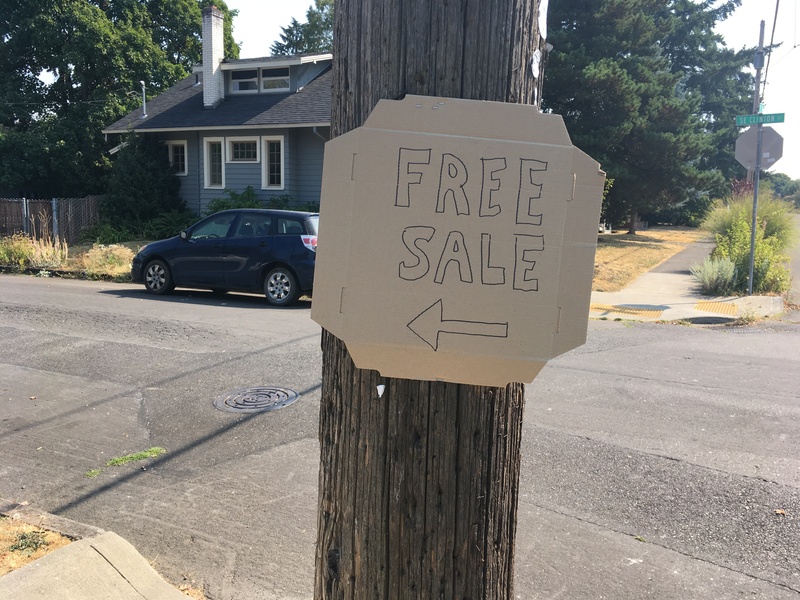 Like most people, I appreciate anything free. I’ve never been able to find free shoes that fit but discarded shoes gross me out anyway. I have unrealistic expectations that all concerts should be free which is why I never go anywhere. I have no idea what a free food hook up is. That no free lunch slogan is the story of my life. The occasional art opening really means free cheese. Considering how disappointing “free” antenna TV is makes paying for cable worth it. Regardless I always hope worthwhile free stuff will come my way. 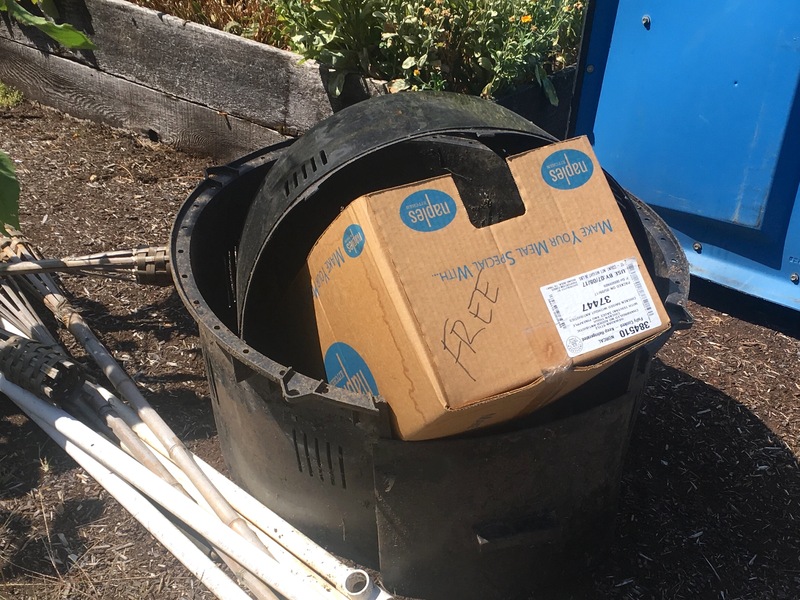 Summers in Portland are good times to leave stuff out for gleaners. People feel confident that even if no one wants their junk there isn’t the risk that it will be ruined by rain. In a survey with no scientific merit, Saturdays were deemed the most popular day for this donation method. It’s the first day of weekend cleaning. I always thought that if I needed a chest of drawers, which I actually would like to have for bike stuff, I could drive around on a Saturday and find one. Spread out your wares so customers can see your free offerings. 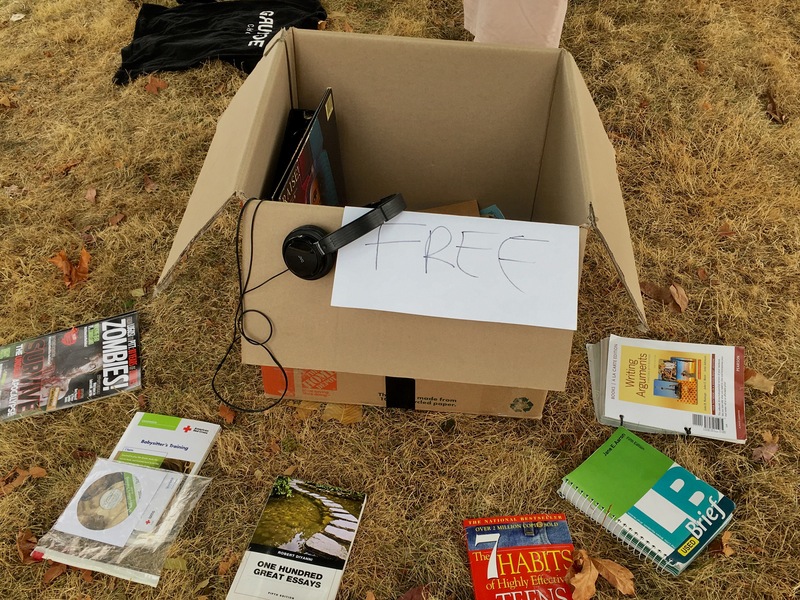 This is a great concept, this placing of goods on the curb in hopes that someone will find value, the value that is no longer found in the item by the discarder, and carry it off eliminating the trip to the dump or the item heading to the landfill. I prefer discard piles that have a sign, otherwise it feels like a gray area that has me questioning whether people are getting rid of items or utilizing lawn storage space. 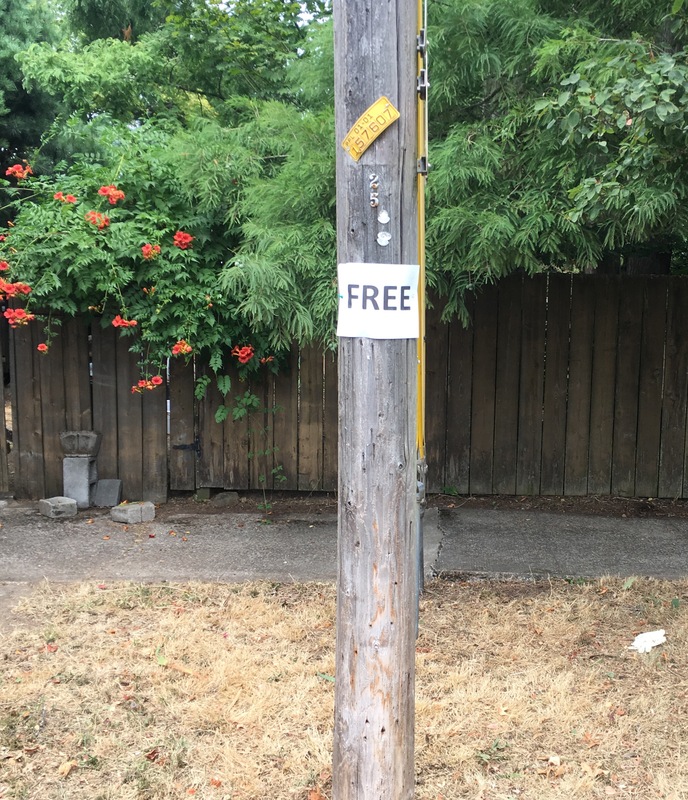 The free sign is optional because it’s a given that stuff on the curb invites people to help themselves. It made me feel better when I asked someone if I could take the tape deck from a signless pile on a curb. I also asked if the deck worked. The answer was sure and “your guess is as good as mine.” Cordiality is unnecessary when dealing with free junk. No free poles, only poles that advertise free couches. I would gather free stuff from curbs on a regular basis but I can’t indulge my hoarder tendencies when I have a basement full of junk. My restraint is incredible. I only window shop curbside free stores taking fleeting glances into pandora’s box-like, free boxes. 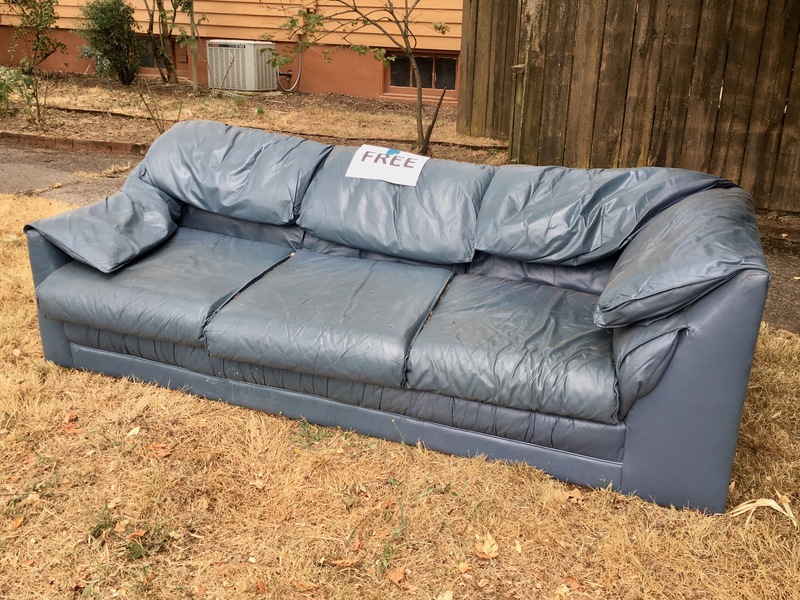 My quest for an old couch, delusional as I may have been that the right one would appear someday, ended after hearing a bedbug horror story that occurred from someone dragging free furniture into their home. Contamination cures couch collection compulsion the headline could have read. A free couch, expertly labeled. Free Boxes have inspired the creation of art. Jon Meyer named his web series The Free Box after encountering many of them in SE Portland. The show centered around broke characters and free boxes that were worked into some of the episodes. Conveinent and recyclable packaging is essential. The free stuff that’s available can be anything. Some of it falls into the “You’re Really Trying to Give That Away?” category. People want to find someone who can give new life to what they need to get rid of, whether it’s a pile of dirt with a sign made from painter’s tape or a collection of broken concrete. Free box books are usually better suited for the Goodwill self-help section yet every once in a while a must-read can be unearthed. A bag of free floral foam was one of the more unusual, yet useful things I’ve seen lately. If you think you really need something and don’t want to pay never give up your quest to find it. 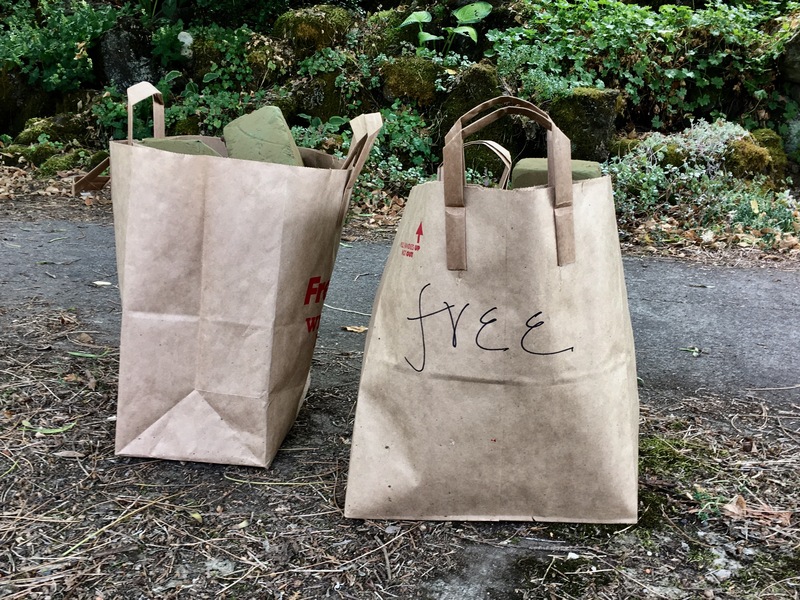 Free stuff will always materialize but more likely when you need it the least. 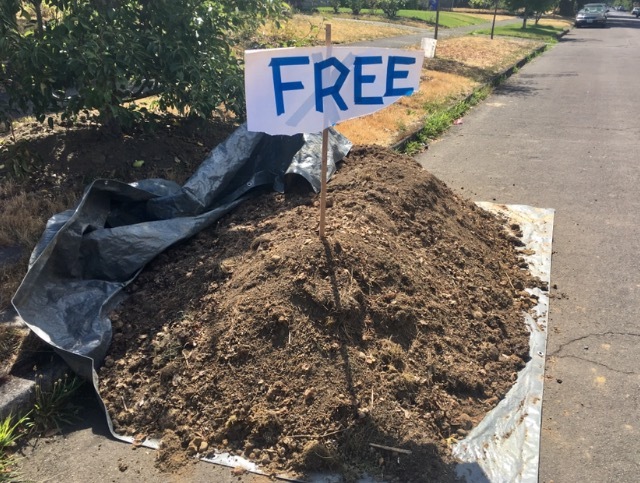 Free Dirt and home made font. 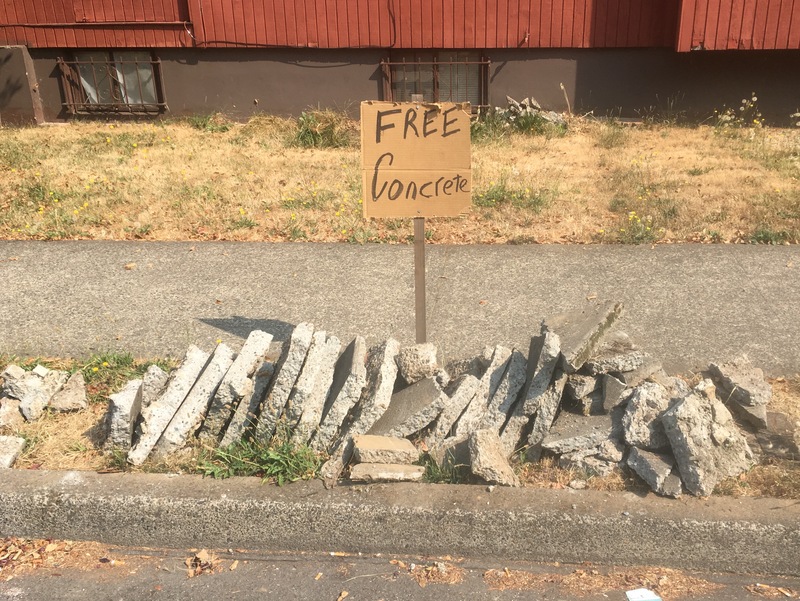 Free is the way I like my chunks of concrete! If you end up at the Sunnybrook Medical Center it may be due to an injury requiring the services of a trauma surgeon. Or you may have something stuck in your ear, nose, throat or somewhere else necessitating a visit to the ear, nose, throat, or somewhere else department. Thanks to a display tucked away in the lobby of the ENT department, I learned all manner of objects can be and are lodged in the human body. The framed story of Dr. Charles Emerick* greets those, suffering and not, who enter. He collected these items during his service at a missionary clinic in India and a Naval hospital in San Diego. His career summited Mt. Scott at Kaiser Permanente where he cached his loot of curiosities upon retirement. The display educates patients, staff, and visitors of the dangers of things and bodily cavities and the coexistence of the two. The origins of this collection, while not discussed in the brief write up, are what intrigue me. That spark, that moment of inspiration when Dr. Emerick committed to starting his collection had me wanting to dig (pun may or may not be intended, I’m just not sure) into this story and uncover more than what the lobby offers. Thanks to modern technology, I was able to access an article about Dr. Emerick. The old school alternative would have had me in library basement futzing with microfiche and an ancient, bulky machine. I found one secondary source available with ease, an Associated Press article that ran in a Fredericksburg, Va. newspaper in 1997. Dr. Emerick had been retired for seven years. A photo showed him looking over his collection. I read looking for the source of his inspiration to collect what are referred to in the story as “items.” And there it was! 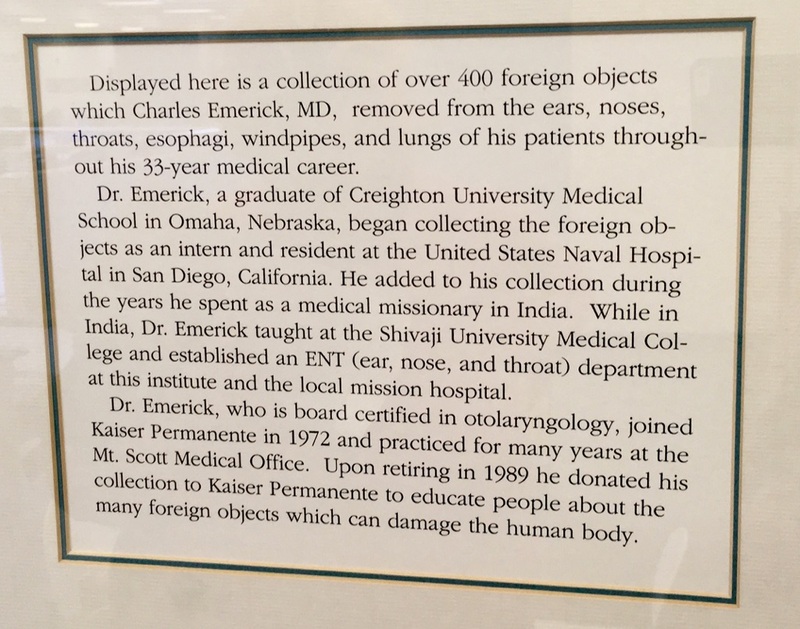 ** Emerick explained he, “was inspired to keep the items because he heard Dr. Chevalier Jackson, a pioneer in endoscopy, had such a collection.” Note that endoscopy is how an item, once lost in the esophagus, trachea or lung, is located. A hollow lighted tube illuminates the included object; it then takes an additional piece of gear for removal should the object prove an obstruction or irritant or otherwise inconvenient or unwanted addition to the patient. It’s noteworthy that the AP writer made an attempt to locate Dr. Jackson’s collection which was last seen at Temple University Hospital. A spokesman uttered the sad words, “nothing remains of the collection.” This gives Dr. Emerick’s achievement heightened stature and highlights its remarkable staying power simply persisting in its low key existence, not as some central attraction of a national medical museum but in the quiet confines of Kaiser’s ENT waiting room. 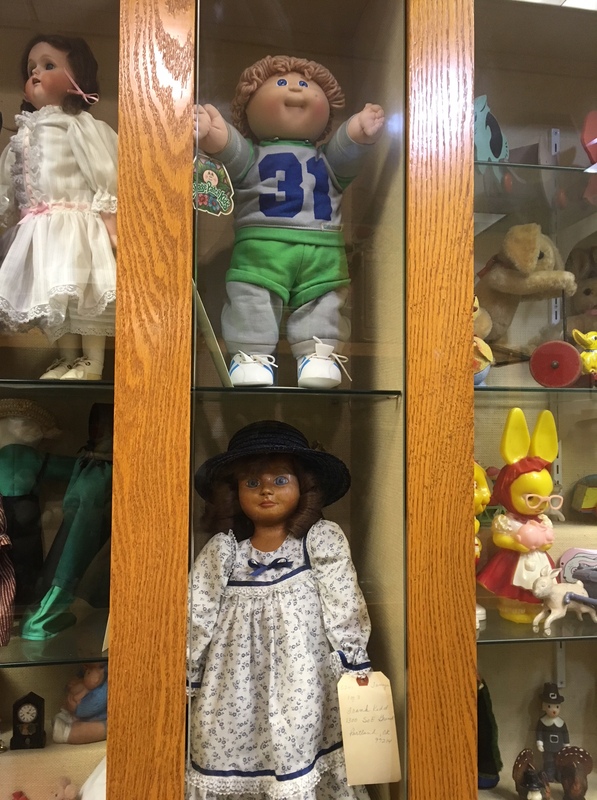 Looking over the items housed in the display case with revolving shelves, the kind of display case you find in antique stores, was as fascinating as it was gross. The first consideration seems to be with the item itself. I thought about the size and shape of the bagged and tagged objects before moving on to contemplate where each was found. It never failed to amaze me. It’s rare to see evidence doctors put this much effort into their jobs. Trash cans have been filled so thoughtlessly over the years. Body junk salvaged from many an Ear, Nose and Throat languishes in landfills, yet the experiments and accidents of Dr. Emerick’s patients live on in a display case in Portland carefully preserved and labeled. It is detritus for all time, but also significant and instructive. Whether a pilgrimage must be made to this strange menagerie is up to you unless you’re accident prone or careless with either money or crayons. If that’s the case, a few extra minutes checking out this collection on the third floor could be worth thousands in future medical expenses. *After a bit of confusion, I figured out that Emerick was the last name of the doctor and not a medical term referring to stuff lodged in the human body. **Mrs. Yuchmow having to justify using the word “and” at the beginning of a sentence always makes me try to find a way to not do it, but I needed to add drama to my story and discovering a tidbit of information concerning something I had been wondering about for a long time but hadn’t gotten around to checking out inspired that sentence: And there it was. Yes you told your students in Princeton, NJ, back in the day, that under most circumstances they shouldn’t start a sentence with the word “and.” In this case you should just be glad I didn’t use an exclamation point.